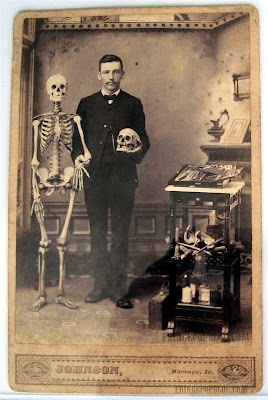 This original, 1890's cabinet card photo might be the most iconic medical-related, antique photo in existence. It's all a matter of opinion, but in terms of content, pose, and composition, I haven't seen a photo that matches this. If anyone out there has a more iconic piece, though, I'd be the first to want to see it. The photo was purchased on eBay in October of 2008, listed without provenance. The original photographer was Johnson of Marengo, Iowa. Based on the tools of the trade, the man is likely an established doctor or medical student. Web searches for Johnson of Marengo, Iowa, produced no results. If anyone knows the identity of the man or more about the photographer, please post.